Ruthiebear (Titusville, NJ, United States) on 31 May 2018 in Lifestyle & Culture. I have had a death in the family in another state over 800 miles away. We will be traveling until June 6 and not sure if I will have time or the ability to check in here. I have posted some images for my absence. Sometimes it is important information. Bonjour Ruthie. Jolie photo ! Toutes mes condoléances pour cette personne disparue. 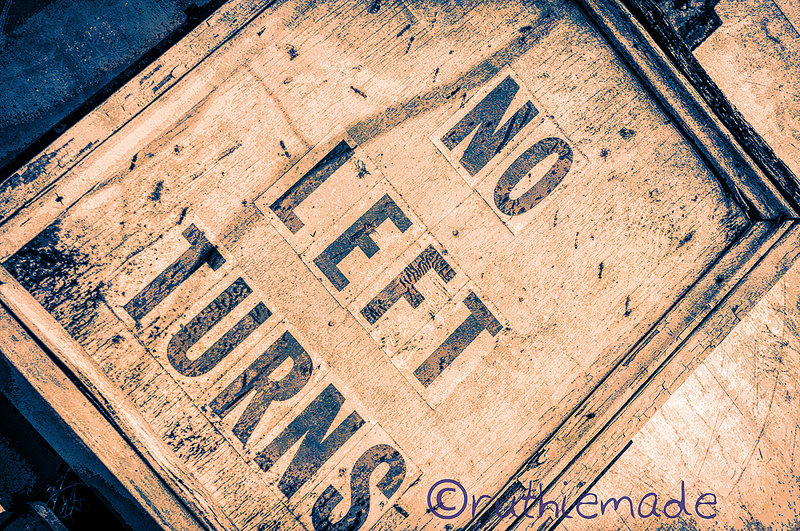 The sign makes me want to turn to the left !! Mes sincères sympathies chère Ruth, je suis avec vous de tout coeur! Big hug! J'aime les textures et les couleurs ! J'aime beaucoup ce genre de photo , le traitement de l'image est superbe ! Even on it's side this old sign still announces its limitation. A fine pciture. The antique sign is quite interesting. Interesting sign with the individual lettering. @Jeff & Pat: THank you dear friends. I had to travel to Tennessee and our flight home was delayed over 5 hours. But it is nice to be back. It is very beautiful, blue is my favorite color ! Looks like a sign that's made one letter at a time! Great find! A lovely sign and presentation. Quelle vue et inscription quel effet génail.